Whether traveling on the interstate between cities or on a rural dirt road, a car accident happens every 6 seconds in the United States. While these accidents range from minor fender-benders to rear-end collisions, when they involved large commercial trucks, the resulting damages can be severe. Following an accident, you may not know where to turn. The size and weight of semi-trucks and tractor trailers can result in major vehicle damage and personal injuries for the passengers in the smaller vehicle. The commercial truck driver will have the backing of their company’s lawyers and insurance company, but who will represent the interests of the average passenger driver? If you or a loved one has been involved in a semi-truck or tractor trailer accident in Surprise, Arizona, then you need a legal representative on your side to walk you through your case and determine the next best step for you. Nathaniel B. Preston of Warnock MacKinlay Law is an experienced truck accident attorney who has worked with a number of families in Surprise, Arizona. With his knowledge of local traffic laws, commercial truck regulations, and personal injury settlements, he’ll help increase your chances of receiving the compensation you deserve. In the aftermath of a life-altering truck accident, you can be left facing a number of medical expenses and car repairs that you weren’t financially prepared for. If your accident was caused by the negligence of the other driver, you shouldn’t have to shoulder the financial burden of someone else’s actions. You have the right to seek and negotiate a fair settlement for your expenses and damages. A seasoned attorney like Nathaniel B. Preston knows what signs to look for when it comes to proving liability for commercial truck collisions. He’ll use this expertise to help you receive full and fair compensation from the truck driver’s insurance company. In addition to your personal injuries and repairs to your car, you may be able to recover compensation for additional expenses like hospital bills, pain and suffering, or loss wages if you’re unable to continue working after the accident. To determine what type of compensation you may be eligible for, reach out to an Surprise, Arizona truck accident lawyer today so they can start evaluating your case. What causes a truck crash or accident? The damage following a commercial truck accident can be devastating for those driving in traditional passenger cars, which is why, in addition to the local traffic laws, there are a number of federal rules and regulations from the Department of Transportation that are in place to protect the truck drivers and those they’re sharing the road with. In addition, commercial truck companies also have safe and responsible driving policies in place that their employees are expected to follow to prevent auto accidents. One example of these types of safe driving rules is the travel log that truck drivers are expected to use while delivering a load. This log tracks the time they spent on and off the road, letting their employers know how long it took them to travel to their destination and how often they stopped for rest breaks. There are federal guidelines that regulates the number of hours a truck driver can be on the road before taking a break. Each driver is responsible for tracking their own hours to comply with these guidelines. These are called “Hours of Service” regulations. Unfortunately, sometimes these “Hours of Service” rules are ignored by the driver in an effort to complete their delivery at a faster time. When navigating a large vehicle like a commercial truck or tractor trailer, it’s important to remain as alert as possible in order to avoid accidents on the road. If a driver is driving while fatigued because they didn’t take a break, then this could result in a devastating truck collision. 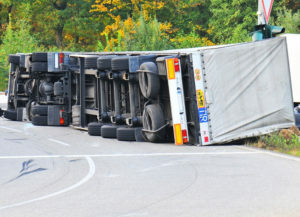 For your truck crash settlement, your lawyer may be able to use their professional resources to gain access to this log to help support your claim that the accident was the fault of the driver. If you believe any of the above directly affected your auto accident, then be sure to let your attorney know when discussing your commercial truck accident settlement. Below, we go over the most common causes of truck crashes in more detail for your benefit. The number one cause of auto accidents in the United States is driving while distracted, and with a cell phone easily at hand for every driver, it has become increasingly easy to take your mind off the road. Texting while driving, talking on the phone, or eating while driving can all be dangerous when you need to pay attention to the road. If you or a loved one has been in a trucking accident and you suspect that the driver may have been distracted, then you may be able to request compensation for your car damages or personal injuries. Driving at a speed that is beyond the legal limit for the area puts everyone at danger. This is especially true if the one speeding is driving a large commercial semi-truck or tractor trailer. These vehicles are hard to stop at certain speeds, which can lead to truck rollover or a catastrophic collision. Even if a driver isn’t going over the legal speed limit, if the weather is foggy, rainy, or snowy, then there could still be an accident if they’re driving too fast for the poor weather conditions. As stated, commercial truck drivers are expected to log the amount of hours they spend on the road so they can ensure they’re complying with federal “Hours of Service” regulations. But if a driver is operating their commercial truck while in a sleep-deprived state, then they may have a slower reaction time or make dangerous decisions the could result in an accident. Driving while under the influence of drugs or alcohol is both illegal and dangerous. If you suspect that the truck driver that caused your accident was under the influence, let your lawyer know immediately so that they can investigate. Most commercial truck companies have regulations that their drivers must follow in order to ensure both their truck and cargo is safe for the road. If an accident occurs because a load hasn’t been properly secured or a truck has been poorly maintained, then you may be entitled to damages as part of your accident settlement. Who should I call after a trucking accident in Surprise, Arizona? After your accident, you may not be able to contact your lawyer or insurance company right away – especially if you or a loved one is rushed to the hospital for treatment. As soon as you’re able, you or someone at the scene should call 911 immediately to alert the police. If medical attention is required for any of the drivers, be sure to contact emergency medical professionals, as well. Once the police are there, they can safely direct traffic around your accident and create a safe place for the EMTs to access the scene. In addition, the police will begin investigating the incident by taking statements from you and the other drive. They’ll use this information to file an accident report. This report may or may not include who they believe was at fault for the incident. It will take some time for this report to be filed, but once it is, it will become public record and you or your Surprise, Arizona, attorney can request a copy for your truck accident settlement. You’ve called the police and received medical attention. Your next step should be to call an auto accident attorney to see if you have a case. Building evidence to prove negligence on the part of another driver is a lengthy process. The commercial truck driver will have their company and their company insurance providers investigating the case to see if they’re liable for your medical expenses and damages to your car. Their end goal isn’t to ensure you receive full compensation following the car accident. They’ll do what they can to prove that their driver was not at fault or that you were partially at fault so that they can reduce the amount of compensation you’re rewarded. Hiring a lawyer as soon as possible ensure you also have representation on your side who can ensure a fair investigation and a fair settlement during the negotiation process. After speaking with your attorney, you should then call your car insurance agent as soon as possible to file an accident report. You should also contact the other driver’s insurance agency, as well. Both insurance companies will investigate the car accident to determine who was at fault and therefore liable for damages. In order to win your commercial truck accident settlement and be awarded damages, you’ll have to prove that the other driver was at fault for the collision. When a case is based solely on the word of each party involved, it can be complicated for the insurance company to determine who is at fault. Due to this, most personal injury or accident settlements are resolved based on the facts of the base instead of statements from the drivers. While explaining your side of the situation can certainly help, you’ll need evidence in order to increase your chances of a successful settlement. Luckily, your Arizona truck accident attorney will have the resources and experience you need to gather evidence for your claim. They can interview witnesses and investigate the accident to determine who was liable and whether you should receive partial or full compensation. While both you and the other driver are at the scene of the accident, make sure you collect all of their personal information. This includes their name, phone number and insurance information. Start taking pictures right away of both your car and the surrounding area. If there are skid marks from both your vehicle and the truck, take close and far-away photos to show the direction they’re going in. Take photos of any street signs or traffic lights as these could give some indication as to the cause of the accident. You should also take photos of any damage caused to your car and the truck. If any passersby or fellow drivers stopped to provide assistance immediately following the accident, be sure to take their statements if you’re able. While your attorney will also interview any witnesses in order to help build your case, any statements that you can gather that day may provide the best information for your claim since the incident is still fresh in their minds. Beyond providing you with a clear idea of your injuries immediately following the accident, your medical provider can also let you know if they feel your injuries will require extensive, ongoing medical treatment. If so, you’ll want to include the cost of any future medical expenses you’ll need in the future in your settlement. While your attorney will be proactive in building your case, they won’t be at the scene of the accident the moment it happens. If you’re able to provide supplemental information that helps set the scene for the crash and provide insight as to why it happens, then you can increase your chances of recovering damagers from the truck driver’s insurance company. What is my truck accident worth? How soon will I settle my truck accident claim? Commercial truck driving businesses and their insurance companies will usually want to settle any accident claims as quickly as possible. This is so that they can avoid losing money due to unexpected future medical developments such as discovering new injuries caused by the accident, psychological issues you may experience after the accident, and the length of time it takes for your injuries to heal. While that first number the insurance company offers you may seem appealing, you don’t want to make the mistake of settling your claim too early. Reach out to your medical provider and discuss the full extent of your options with your attorney. You can use the knowledge and experience of these professionals to determine if settling is the best decision you can make right now, or if you should wait for an offer that covers the full extent of your needs for the future. Should I file a truck accident lawsuit? Most insurance companies will be in a rush to settle a commercial truck accident claim as soon as possible. The commercial trucking company won’t want the bad publicity or the expense that a traditional hearing could bring. But despite all of the supporting evidence, you and your lawyer has gathered for your settlement, in some cases, the driver’s insurance company will refuse to give you full and fair compensation. If it becomes increasingly difficult to negotiate with the insurance company because they don’t want to cover the full extent of your injuries or car repairs, then your lawyer may suggest filing a truck accident lawsuit instead. Having the full incident presented to a judge may be the best way to ensure you receive as much compensation as you deserve. If a commercial trucking accident has drastically changed your or a loved one’s life, then you have the right to seek a fair settlement for your damages and injuries. Contact Nathaniel B. Preston of Warnock MacKinlay Law today to start the investigation into your case. Nathaniel has years of experience representing car accident, wrongful death, and personal injury victims in Surprise, Arizona, and the surrounding area. He’ll use this knowledge to help build a case for your commercial truck accident lawsuit or settlement. Our number is 602-652-2009.